Lady sings the blues. The Three of Swords represents the sorrow that is part of life, whether it's a mild case of the blues or a great abyss of mourning. 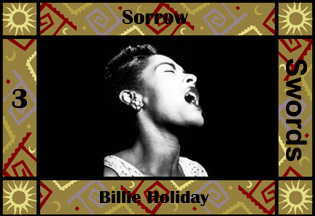 Billie Holiday had a life full of sorrow. But her life shows us that even the depths of sorrow can be the source of great beauty.